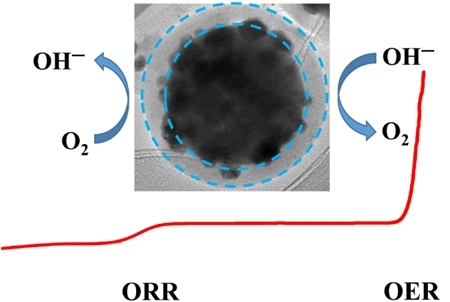 The development of highly efficient and earth-abundant oxygen evolution/reduction reaction (OER/ORR) catalysts is essential for rechargeable metal–air batteries. Herein, cobalt-based hydroxide nanoparticles @ N-doping carbonic framework (CoOHCat@NCF) core–shell structures have been designed as highly stable and efficient OER/ORR bifunctional catalysts. The obtained composite shows enhanced catalytic activities and excellent stability in alkaline media. In the OER, a high turnover frequency (2.03 s–1 at an overpotential of 0.36 V), low overpotential at high current density (100 mA·cm–2 requiring an overpotential of 0.38 V), and excellent stability (100 mA·cm–2 for one week with no activity loss) have been achieved. Furthermore, although cobalt species-based catalysts are known as good ORR catalysts, their hybridization with NCF obtained from metal organic frameworks successfully enhanced their ORR activities. The efficient activity of CoOHCat@NCF as a bifunctional oxygen electrocatalyst can be ascribed to the core–shell structures stabilizing the active catalytic sites and the porous shell structure favoring electrocatalysis-related mass transport. Supplementary material (experimental details and data, video of oxygen gas formation) is available in the online version of this article at https://doi.org/10.1007/s12274-017-1765-2. 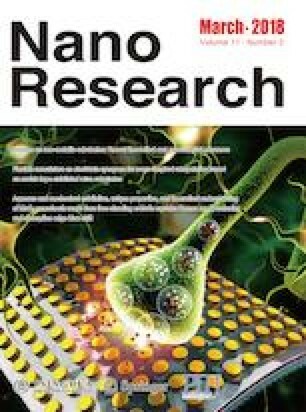 The authors acknowledge financial support from the National Basic Research Program of China (Nos. 2013CB932601 and 2014CB239303) and the National Natural Science Foundation of China (No. 21133001). Supplementary material, approximately 2.82 MB. Supplementary material, approximately 3.33 MB.